Actually, the truth is, I was browsing my favorite blogs early one morning, and was reminded by Smitten Kitchen of how tasty Moroccan food is and then I shot Gene a quick link to the SK blog and the recipe. Gene must have remembered how much he loves the spice combinations. He took the bait like a hungry fish and had this stew simmering on the stove when I got home from work. 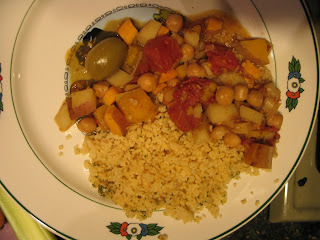 Served with Couscous and a little squirt of Harissa, super! We were so ready to be transported that we even forgot to add the garnishes, cilantro, yoghurt, and almonds. Those will be added to the next servings, leftovers are a good thing. Loving the pictures and the commentary. Keep it up! I'll keep reading! It was delicious, and it was delicious the next day, and again. I love the combination of the spices that is made even better with the health benefits of this meal. I closed my eyes and felt my body sway with the motion of the camel transporting me across the desert and into the crowded market of Djemaa el Fna.